May it bring you as much joy and blessing in listening to this album, as it has given me in making it. Thanks be to my “Lord Jesus Christ” who’s blessing and guidance was upon making the album from conception to finish. 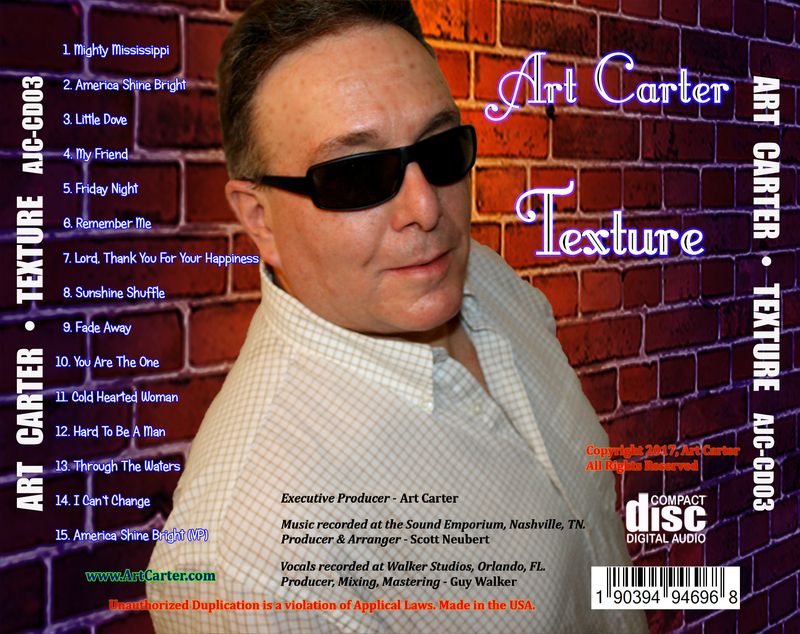 All songs written by Art Carter, except “Friday Night, Cold Hearted Woman, and I Can’t Change”, co-written with my brother “Jeff Carter” / Art Carter Music / ASCAP. Thank you “Don Reed” & “Dixie McCorkell”, for your mentorship, encouragement, and guidance in the music business. And for helping me get my songs on the radio and Country Music Charts. Music Recorded at the Sound Emporium, Nashville, TN. Scott owns and runs Smash Recording Studios / Nashville, TN. He has decades of experience in playing acoustic guitar, dobro, mandolin, steel, recording, producing, arranging, writing and singing. Scott played acoustic guitar & dobro – Trace Adkins “Big Time” CD, acoustic guitar & background vocals – Hal Ketchum “The Hits”, “Sure Love”, and “Every Little Word” CDs. Scott played on on – Jeff Bates “Leave The Light On” CD, and also played dobro on – Gail Davis “Live And Unplugged At The Station Inn” CD. He played acoustic guitar, dobro, mandolin on – “Homeless in America”, a Charity CD by Nashville’s Roots Musicians. Scott played resonator guitar and sang harmony vocals on – Donna Ulisse “Walk This Mountain Down” CD, he played on – Jessee Williams “The Truck Stops Here” CD. Kyle was the engineer the day of my music recording at the Sound Emporium, in Nashville. He did a great job. Kyle began his career at Studio 19 when owner Larry Rodgers saw his potential. Shortly after being made a member of the staff, he began engineering many of the studio’s sessions himself. Some of his first big projects were for country greats like Ronnis Milsap and Lynn Anderson. Kyle is the resident engineer for Studio 19, now at the Sound Kitchen in Nashville. Since moving to Nashville from his home in Indiana, guitarist Jason Roller has played with Ken Mellons, The Kinley′s, John Berry, Lila McCann, Darryl Worley, Mark Chesnut, Tracy Lawrence, Joe Diffie, Dolly Parton, Kellie Pickler, and Sarah Johns. In the studio, he has played on Ken Mellons “Best Of” album and Joe Diffie′s “Tougher Than Nails” CD on Broken Bow Records. A virtuoso on electric and acoustic guitars, Jason cites influences starting from back in the bluegrass days with Mark O′Connor, Tony Riceand New Grass Revival to guitar players such as Brent Mason, Dann Huff, Eric Johnson, Albert Lee, Steve Vai, Stevie Ray Vaughn, John Mayer, The Rippingtons, Steely Dan and many more. Jason lives in the Nashville suburb of Murfreesboro, where he records and produces demos at his own studio, The MagicShack, on the web at www.magicshackdemos.com. Matt moved to Nashville in 1975 and started touring with the gospel group “The Downings”. He started with “The Four Guys” at the Grand Ole Opry in 1978. He played the Opry every weekend until 1983, when he worked as bassist for country/pop artist “Sylvia”. In 1990, Matt became a “Statesider” when he started playing for Mel Tillis. After a few years with Mel, he decided to follow his passion in recording. He started doing recording sessions daily while playing live at the Grand Ole Opry with Jimmy C. Newman every weekend. He was also a part of the staff band for the internationally televised ICM awards and started producing song writer demo sessions and independent artist CD’s. Matt played with Jason Crabb on the internationally televised ICM 2009 awards show. Steve played drums on – Kevin Maines “What I Am” CD, drums & percussion on – “Homeless in America”, a Charity CD by Nashville’s Roots Musicians, and on – Pete Berwick “Ain’t No Train Outta Nashville” CD. Steve played drums & percussion on – Betsy Foster “A Dream Come True”, on – “Bear Essentials” by Various Artists, and on – Destined “Call The Physician”. He played drums on – Melissa Gibson “Lighthouse Point”, on – Roger Idaho “Ponderay County USA”, on – Crystal River “Taking A Stand”, on – Melissa Gibson “Welcome To Stay” CD, and many others. Steve has been in the music industry for many years. 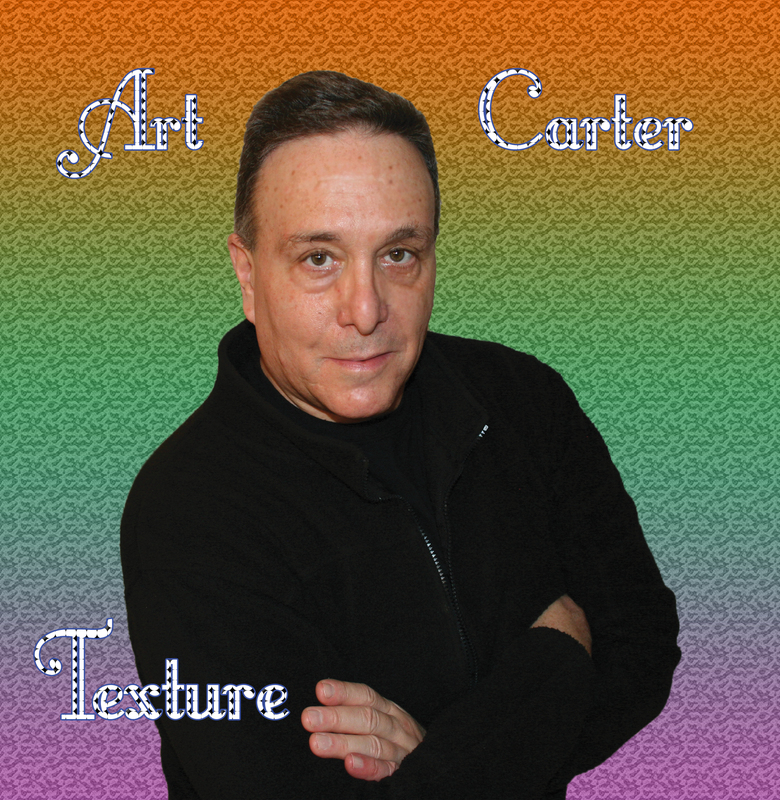 Over the years, he has worked for many artists. The short list includes Alabama, LeAnn Rimes, Sara Evans, Martina McBride, and Jake Owen. He has also backed many artists on TV shows, to include Trisha Yearwood, Jason Aldean, Luke Bryan, Johnny Rzeznik, Wynnona, Jordin Sparks, and Kris Allen to name a few. TV credits include “The Voice”, “The Tonight Show with Jay Leno” (5 times), “The Today Show”, “Good Morning America”, “The Late Late Show (CBS), “The Ellen Degeneress Show “ and The View. Other TV credits include“Live with Regis & Kellie”, “Larry King Live” and “Jimmy Kimmel Live”. He has worked on the “CMT Music Awards” as keyboard player in the house band (3 times). Has also appeared on the CMA ‘s, ACMs, and ACA Awards shows multiple times. A few recording credits include “The Last Stand” by Alabama , “All I Really Wanted to Say” by David St Romain , “Black Roses Red” by Alana Grace (for the movie “Sisterhood of the Travelling Pants”) , and “My Town” by the Poverty Neck Hillbilies. Steve currently is Musical Director and Keyboard player for the group “Alabama”, and assumes the same role for lead singer Randy Owen’s solo dates. He also owns and runs 524 Productions. www.524productions.com. Sam went to Harvard College and studied jazz with Dave Baker, flute with James Pellerite, saxophone with Eugene Rousseau and clarinet with Bernard Portnoy. He has worked in the studios and clubs of Nashville consistently since 1976, doing recording sessions on Music Row and in the early 90′s began recording as an artist for the Greenhill/Springhill label. On any given day, he might be playing for a film soundtrack, flute for Mandisa, clarinet for Wynonna, penny whistle for Amy Grant or saxophone for Lynyrd Skynyrd. He recorded for Vince Gill, Aaron Neville, The Brooklyn Tabernacle Choir, Carrie Underwood and Kenny Chesney. He has played shows with Sammy Davis Jr., Mel Torme, Henry Mancini, Dolly Parton, Vince Gill, Reba McIntire, Michael McDonald, Al Jarreau, Liza Minnelli, Amy Grant, Toby Keith, Lynda Carter, Michael W. Smith and Larry Carlton. As an artist, Sam has 19 recordings on three different labels. He is an active member of Westminster Presbyterian church where he serves as a musician and elder. In addition to playing flute, pennywhistle or saxophone for worship, he provides Celtic or Dixieland bands for services at his home church or other area churches. Sam’s leadership at Westminster Presbyterian follows a life-long spiritual development that began with his parents marriage of Jewish and Christian traditions. He leads a band called “City Lights” that does wedding and business receptions. We do family and music industry events for clients who want a band that has style and creativity. The traditional jazz group, “Bourbon Street” and the contemporary jazz group, “Phatjaz“, are also active. Vocals recorded at Walker Studios, Orlando, FL. Guy has many credits as a Producer, Music Director, Songwriter, Arranger, Guitarist, owner of Walker Studios, Orlando, FL, and of “Guy Walk Publishing” (BMI). He was Co-Arranger on the song “Time” on the Backstreet Boys CD Black and Blue, Orlando Magic (NBA) Theme Music (Session guitarist / arranger), and Mission To Mars (Studio guitarist / original music writer). Guy has been Music Director/Guitarist for John Secada & Joey Daniels, Music Director/Guitarist (Big 3 Record / Entertainment), and Hard Rock Academy (Summer Rock and Roll Camp) – (Guitar Instructor). He has played guitar on tour with “Brian Littrells” Japan tours 2006 & 2007, played guitar on – “Backstreet Boys” (Millennium Tour May 1999 – March 2000), on – John Secada & Joey Daniels shows in Phoenix, Arizona and Treasure Island, Florida. Guy has also played guitar as a studio musician on – Golf Channel “Big Break 5 Hawaii” (Final Score Production / Glenn Longacre producer), on – Deborah Gibson Song / “Naked” (Big 3 Records), played guitar for – John Secada, and on – Tabitha’s Secret (National Release) (Rob Thomas – Matchbox 20 – Vocals).